About 15 km west of Rio de Janeiros Zona Sul (South Zone) is Barra de Tijuca; Tall residential buildings tower along a never ending beach. The neighbourhood continues along an 18 km stretch of beach that changes name about halfway to Recreio. These are the two newest residential areas of recognition in the city. Rio de Janeiro’s need for residential and commercial expansion lead to an expansion west. 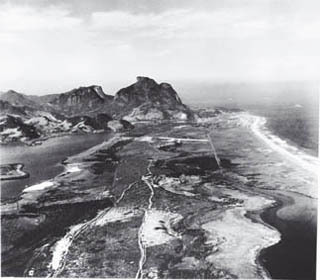 Barra de Tijuca was in the 1960’s nothing more than a scarecely exploited sand dune. Barra actually means sandbank in Portuguese, tijuca is from an Indian language and means something like swamp; It is referring to the many lakes, rivers and swamp lands in the area. Promise of a luxurious life style and the growing violence problems in Zona Sul attracted many middle to upper class Cariocas there in the 1980’s. Big car avenues, shopping malls and closed condominiums soon became standard and has made it famous as a new Miami. The need for more space soon made Recreio an area of expansion although it has not at all gone to the extreme of Barra. This is what Barra de Tijuca looked like before, the photo is probably from around 1900. Actors, football players, new rich, models and all those who want to live close to them are the typical Barra de Tijuca resident. The luxurious condominiums attract people from all over Brazil. The neighbourhood of Recreio is more a middle class neighbourhood. As everywhere in Brazil, where there are rich people and promise of work, you have favelas and poor people as well, if they weren’t who else would clean the pool? The other big pastime is sports: Surfing, wind surfing, kite surfing, beach volley, running, fitness, golf… Well the list can continue. Health, beauty and fitness are dominating features in the neighbourhood and options to obtain it are abundant. Not only Barra Beach but some natural reserves offer great opportunities to get away from the hectic life in the city. There are quite a few options. Restaurants and bars are along the main avenue Av. das Américas; in and outside the shopping malls. There are also some nightclubs. The most famous and long running is Nuth. There is also Condomínio Condado de Cascais which is kind of a commercial center with many restaurants and bars. It is located right in the “beginning” of Barra on Av. Armando Lombardi 800, close to Shopping Downtown. There are also a few concert venues around. What would a Miami be without recreation parks? The big aquatic park Rio Water Planet is normally only open on weekends. It´s far away, they have instructions on how to get there on their homepage.